The E34 Series 30.5 mm pushbutton line features the same rugged die cast construction of our 10250T line with an additional two layer 100% solid thermosetting cathodic epoxy coating. This coating provides a flat black smooth, consistent, corrosion resistant surface that has passed a demanding 600 hour salt spray test. (The industry standard for this 4X test requires only 200 hours.) E34 cathodic coating is not recommended for use in applications where exposure to ultraviolet light exists—use NEMA 4X 10250T operators. The contact blocks feature enclosed silver contacts with pointed "reliability nibs" for reliable performance from logic level up to 600V. To ensure reliable switching, nibs bite through oxide which can form on silver contacts, eliminating the need for expensive logic level blocks for most applications. 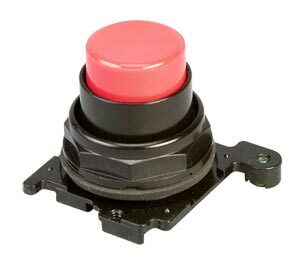 The E34 Series pushbutton operators offer front of panel drainage via holes in the operator bushing. Hidden from view by the mounting nut, these holes prevent buildup of liquid inside the operator, which can prevent operation in freezing environments. The holes also provide a route for escaping liquid in high pressure washdowns, effectively relieving pressure from the internal diaphragm seal, ensuring reliable sealing in applications even beyond NEMA 4. Operators come with bulb, order lens separately. Complete 3-Way Switch, with black lever knob and 2NO/2NC contact blocks. Momentary Non-Illuminated Push Button Operators, contact blocks sold separately. Momentary Illuminated Push Button Operators, requires lens and contact blocks, each sold separately. Maintained Illuminated Push-Pull Operators, requires lens, light module and contact blocks, each sold separately. 참고: To order a complete system, add a contact block and legend plate to operator. All operators and indicating lights come with instruction manual.